I came to Mataram for some shopping. Stupidly I forgot most of the shops are shut on Sunday. As I’d never been to Narmada Park, I decided to hop in a cab and take a look. Situated roughly 10km from Mataram in the village of Lembuak, West Lombok, Narmada Park is the legacy of a King. 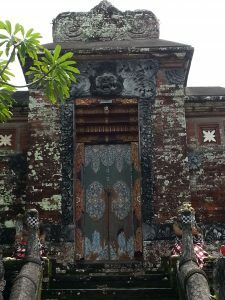 King Anak Agung Gede Ngurah of Mataram built Narmada in 1727 as a place of offering and ceremony, specifically for the Hindu ceremony of Pekelem, which is held at the time of the full-moon in October / November. The park was built to resemble Mt Rinjani, a landmark of cultural and religious significance. Balai Petirtaan is one of the major attractions of Narmada. Three water sources springing from Mt Rinjani meet in Narmada: Suranadi, Lingsar and Narmada. It is believed that the water has the power to keep you young – the old promise of “eternal youth”. Narmada is a nice place to spend a morning or afternoon. The gardens are spacious and well kept, and the swimming pool is refreshing. It’s seems to be an excellent place to take children – there were lots of laughing kids splashing around having a good time when I was there! Unless I was completely blind, I think what was lacking was some information about the place. There were a few signs and plaques, but not much for the feckless foreigner! There were lots of little food-stalls serving satay and the like, but I didn’t eat anything so can’t comment on that one! Rinjani Dawn Adventures doesn’t organise trips to Narmada, but we can provide a car and driver for day-hire or custom itineraries.